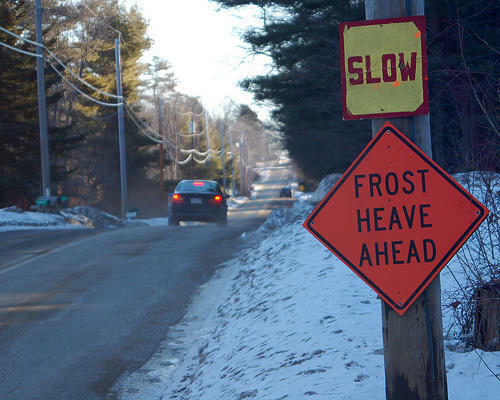 According to a report by the Associate Press, Federal transportation dollars for New Hampshire road maintenance fell by more than %5 between 2008 and 2013. New Hampshire’s department of transportation spending has also fallen by more than 16% over roughly the same period. This has meant delays to regular maintenance to secondary roads and bridges. And as these roadways deteriorate, the state will have to pay a higher price for reconstruction. New Hampshire rates more than a third of state roads as in “poor” condition. And another 50 miles get added to the list each year. As lawmakers consider raising the state's gas tax, you may be wondering: are New Hampshire's roads getting worse? Why are they getting harder to pay for? And, does it really matter if we have a few more potholes? A year after failing to agree on how to pay for a long list of road and bridge improvements, lawmakers will take another shot at bolstering the state’s chronically underfunded infrastructure this session. Several bills are on the table, including one that would channel proceeds from a casino into the state’s highway fund. The New Hampshire Department of Transportation is doing night paving work associated with a reconstruction project at the intersection of U.S. Route 1 and the U.S. Route 1 Bypass in Portsmouth. The work is scheduled for Sunday through Thursday, Aug. 14, from 7 p.m. to 6 a.m. each day. The department says drivers traveling through the work zone during these time periods should anticipate traffic shifts and possible alternating traffic during overnight hours. Uniformed officers and flaggers will guide motorists through the work zone. A 100-year-old bridge across the Merrimack River in Concord is closing sooner than expected due to safety concerns. The Concord Monitor reports that the Sewalls Falls Bridge is shutting down Monday. The bridge was slated to remain open until construction on its replacement began in the spring. But city officials decided to shut it down soon because of its deteriorating condition.